ADAM Simpson says West Coast has to "find a way" to cope with a depleted backline after he all-but confirmed Mitch Brown would be sidelined for the rest of the season due to a knee injury. 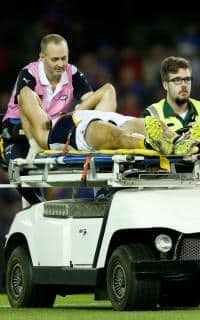 The Eagles are "99 per cent" sure the 195cm backman damaged his anterior cruciate ligament in an innocuous marking contest during the first quarter of their 10-point round one loss to the Western Bulldogs. If confirmed, Brown will have to undergo his second left knee reconstruction. The 26-year-old missed the entire 2008 campaign after a pre-season incident, and his latest injury comes after reigning club champion Eric Mackenzie ruptured his ACL during the NAB Challenge. The injured defenders leave massive holes in West Coast's backline, with the Eagles having to rely heavily on second-year swingman Jeremy McGovern against the Dogs. The 22-year-old stood up and restricted high-priced Dogs recruit Tom Boyd (one goal), while also collecting 26 touches and taking 12 marks – five contested. McGovern should be helped by the inclusion of Will Schofield (ankle) to face Carlton on Friday night after the 196cm defender played for WAFL affiliate East Perth on Good Friday. But the Eagles' key defensive stocks are now threadbare, with Simpson admitting the club's developing youngsters aren't ready to play at AFL level. "We've just got to find a way. It's round one. Just as we were working through the 'Ezy' situation – the Eric situation – now we've got to work through Browny," he said. "We've got to see what stocks we've got left and move on. "There's some developing key defenders that we're working through, but they're probably not ready. "Will will fill the void, I'm assuming next week, but like I said we've got to find a way." Despite losing Brown early, Simpson refused to blame the injury for the Eagles' narrow defeat. "We had to change a few things, there's no doubt … but I think it would be doing the Bulldogs a disservice to say the reason we lost was because we lost Brown," he said. "I thought they clearly held up for longer than we did. Tackles (74-93) we got blown away, clearances (33-49) blown away. The game was played in their half. "I thought our defenders actually defended pretty well. It was just the supply and the lack of it up the other end." Simpson praised McGovern and small forward Jamie Cripps (five goals), but was disappointed with the Eagles' midfield, which was soundly beaten by the Dogs. West Coast leaked 17 more inside 50s and was beaten at the clearances despite winning hit-outs 47-36. "Really disappointing because we had patches where we were good, but not for long enough," Simpson said. "Until we do that it will be a 50-50 call on supply and then result. They know that, we've been working on it a lot. "We're still a young developing list but there's got to be a time where we actually step up and take some accountability." West Coast has six days to lick its wounds and regroup before facing Carlton at Domain Stadium on Friday night.